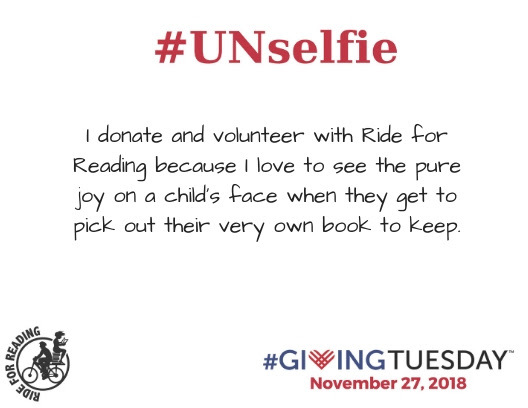 In 2019, Ride for Reading is planning to deliver over 3,000 books in the Nashville and surrounding areas and over 5,000 books across the U.S. Give the gift that keeps on giving this #GivingTuesday! Celebrated on the Tuesday following Thanksgiving (in the U.S.) and the widely recognized shopping events Black Friday and Cyber Monday, #GivingTuesday kicks off the charitable season, when many focus on their holiday and end-of-year giving! One of the best ways to get involved is in your own community either by volunteering or donating to a local charity! We have a lot to be thankful for and want to share that with our followers & supporters! We have been engaging with the community and sharing #UNselfie’s from our staff, Board of Directors, Volunteers, Partners, Sponsors & Donors on our Facebook, Instagram & Twitter pages! Print the #UNselfie image below. Write why you donate to, support and/or volunteer with Ride for Reading. Upload & share on social media anytime between now and Tuesday, 11.27.18. There are several ways you can get involved with Ride for Reading. We have concluded our book deliveries for the year (2018) but we will pick back up in Spring 2019. We currently have opportunities for book sorting, cleaning, organizing, office/Administrative help as well as serving on our Board of Directors or getting involved with our Events/Planning, Fundraising or Grant Writing Committees. If you would like to learn more, send us an e-mail at: info@rideforreading.org. If you are looking to make a year-end donation, please consider donating to Ride for Reading. All funds raised will benefit future Ride for Reading programming & book deliveries, volunteer recognition and some of our substantial operational costs. Donations can be made online at: www.rideforreading.org/donate, by clicking the button below or by check (mail to: Ride for Reading, 1515 Elm Hill Pike Suite 107, Nashville, TN 37211). Click below to make a difference with your donation to Ride for Reading! Thank you to everyone that has generously supported Ride for Reading’s mission to promote literacy & healthy-living in low-income communities over the last 10 years!